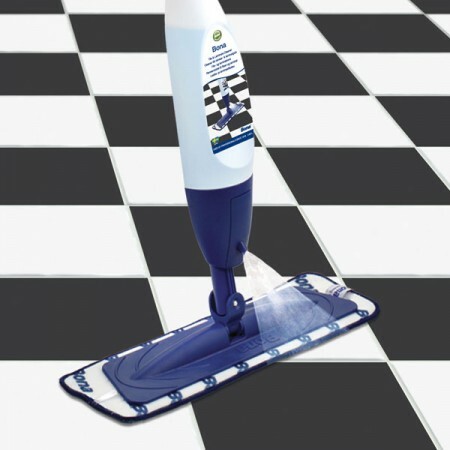 Bona Spray Mop for Tile & Laminate floors enables you to clean and maintain your floors in a sweep. Ergonomic and simple to use, the Spray Mop is quick to assemble and refill with the specially developed Bona Tile & Laminate cleaner. Forget filling up a bucket and adding concentrate, just spray and clean! You can use Tile & Laminate cleaner on tile, laminate, and other hard surfaces such as ceramic, linoleum, vinyl, granite and more. The mop is especially effective on shiny surfaces - such as black ceramic tiles for example - as the non-streak formula leaves no residue and dries almost instantly!